Sorry it's been so long since my last update. The blog got 43k hits in 1 day after my Quake entry, and it honestly freaked me out a bit. I couldn't help but ask myself, was I too open and honest on the internets? 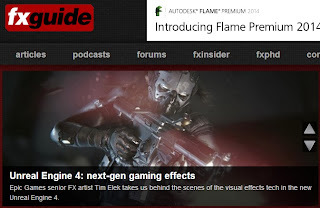 We made a video where Zak and I talk about VFX in the Infiltrator demo from last year's GDC. I talked a bit...contrary to popular belief no raging elephants were injured. I also did a quick interview for FXGuide to time up with the video release, it goes into a bit more detail. There were a bunch of sites that posted news about the video, on a personal level I got really jazzed about Wired UK making a mention. 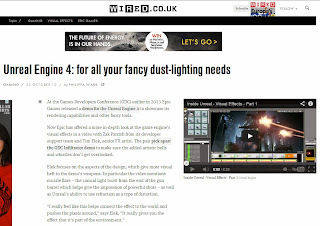 Wired is one of my favorite print publications, so getting mentioned, even just on a web page, got me pretty excited. Keep an eye out for part 2 coming very soon. I'll try and be less paranoid, and maybe update this thing a bit more often.